But all this begs the question: How do they know how many subscribers opened the message, and clicked a link? Excellent question. Most ESPs use two methods for such tracking: a “tracking pixel” in the message, and “tracking links” for any links you include in the message. Let’s take those one at a time. Can you see how that might be helpful? It’s nice to know that your readers are paying attention …or not. OK, so it’s nice to know readers are opening your messages, but you probably have some sort of “Call to Action” in your message: click for a blog post, click to buy something, click to see a video you recommend, click to …whatever. In each case, a click is involved. When AWeber (and most other ESPs) track clicks for you, they can do it two different ways: first, by completely changing the link, so that your link to http://www.example.com/some-page/ becomes something like http://clicks.aweber.com/ABC1234-XYZ9876-2468MSG-link47 (see the similarity to the tracking pixel above?) When a reader clicks that, AWeber counts the click, and quickly redirects the reader to the URL you intended. It happens so fast they’re unlikely to see the detour. There’s a drawback to that default URL change, though: if your reader pays attention to such things (and more and more, smart subscribers do), your readers are expecting your URL, and may not even know what “aweber” is. They may be wary about clicking a link if it’s not to someplace they expect to go. So AWeber, at least, has an alternative method: you can put an AWeber-provided script on your web site so that you can use your own domain, and the tracking links will look something like this: http://www.example.com/some-page/?awt&ABC1234-XYZ9876-2468MSG-link47 — the same information, but attached to the end of your URL, with no intermediate redirect on AWeber’s servers. Yet the script on your site sees the click come in and reports the click back to AWeber so that your stats can be incremented. Readers who pay attention are not likely to be alarmed by the information appended to the end. And here’s something tricky: you know the readers whose “opens” aren’t counted because for one reason or another, they don’t call for the tracking pixel? Well, if the subscriber clicks a link, and that link click is counted, that’s an “implied open” (else how could they click the link? ), and that user is shown to have opened that message. Cool! 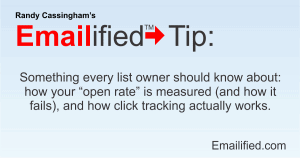 That helps make the open rate that much more accurate — but it still won’t count those who don’t call for the pixel and don’t click any links, even if they read every word of your email. There just aren’t any more accurate ways to determine whether your reader opened a specific email than this. The resulting data can be very powerful. You could, for instance, set up a “list segment” at AWeber for “any subscriber who clicked THIS link” and send them all a follow-up message — a message that only goes out to that specific group. And the possibilities implied by that should get your juices flowing! Even if you’re not doing something that sophisticated, though, having all this tracking going on allows you to do your “Spring Cleaning” to clear uninterested subscribers off your list, saving you money and increasing your sender reputation, as discussed in the Spring Cleaning article. Wrong Way: <a href=”http://www.example.com/some-page/”>http://www.example.com/some-page/</a> — a link that is “anchored” on text showing the link. Why is that bad? First, since that’s a very common spammer trick, your message is very likely to end up in the spam bucket. Even if it’s not dumped into spam, when a reader tries to click the link, many email programs will warn them that the actual link doesn’t match the displayed link …because that’s a common spammer trick. Either way, you’re not likely to get many clicks — and that’s why you sent the email in the first place, right? To get those clicks? there won’t be a mismatched link warning thrown up to worry your reader. This just scratches the surface about what you can do with such tracking statistics. The idea here is to show you how it works so that later, you can do things (such as spring cleaning). I’ll cover more about other advanced techniques this tracking enables in a later article.